"They had to take me to the back and give me salt tablets, but my coach is still screaming, NEW NATIONAL RECORD." Michael Cherry doesn't have complaints at this point in his life. Currently living in Los Angeles, the 24-year-old professional sprinter for Nike has seen his faire share of success over the last few years. He won two silver medals at the World Indoor Championships last March, scoring individually at 400 meters and for Team USA's 4x400 squad. And weeks prior, he won his first USATF Senior Men's Championship in the 400m, holding off Aldrich Bailey and Vernon Norwood at the line in 45.53 seconds. In Cherry's eyes, those few months were a sign, in that his hard work over the last six years hasn't gone unfulfilled. From his beginnings in Chesapeake, Virginia, to now, hard work has always been the blueprint for his success. In 2018, he graduated from Louisiana State University with a degree in sociology and a minor in psychology, and in college he was a 2-time NCAA Champion (in the 4x400), a silver medalist at the World Championships (in the 4x400), an 8-time All-American and an SEC Champion. But it all had to start somewhere. And in some ways, there was one race that set in motion Cherry's rise in track and field. 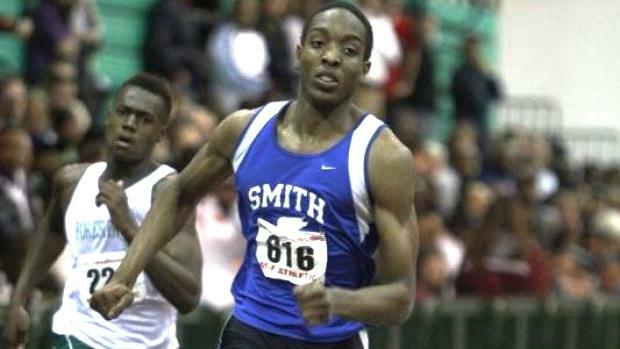 In 2013, the Oscar Smith senior set a national record at 300 meters (it now stands US No. 5 all-time). In the first of an ongoing series that will take a look back at historic races in history, we'll dive into that race, and what made it so special for Cherry. In six years, Cherry has yet to run another 300 meter race. "I low key want to run one," Cherry said recently. "I think I can run 31 or 32 low. I want to reset my mark and see what I can do." Cherry: "I didn't run track in middle school. I played soccer for a little bit and played football most of my life. I was bored, so I wanted to try running. I didn't know that it was an actual sport." He remembers seeing a photo of Usain Bolt in a yearbook. Cherry: "I thought he was racing people from other countries for nothing. And then I met a coach who told me to try out track. My first year was bad. It was bad. My first open 400 was like 56 seconds. In my first two races I got walked down. I think it was the 4x200 and 4x400. I got walked down by the same person. That was harsh. At that point, I didn't know what type of career I would have in running." 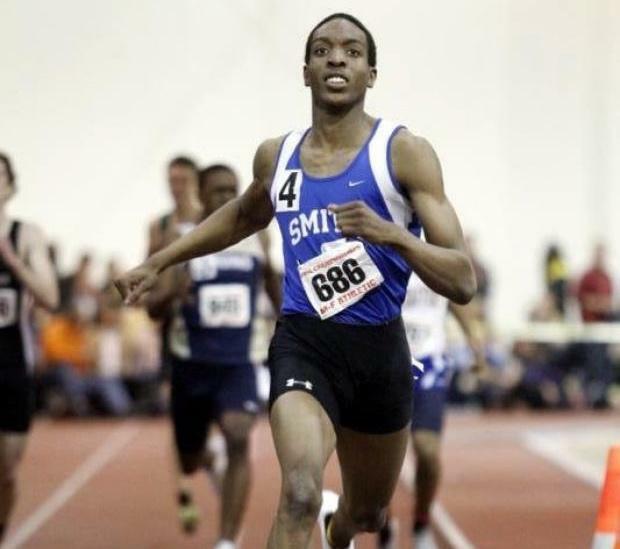 Cherry started out in the 400m and 800m races, posting times of 49.25 seconds and 2:01.77 as a freshman. The next year, he converted to the 200m and 400m and started working with Nansemond River coach Justin Byron on the side, along with his high school coach, Scott Brunet. But then a chance encounter took place in the Greenbrier Mall in Chesapeake. At the time, Cherry, then a sophomore in high school, was working at Finish Line. He saw an advertisement on Twitter to win tickets to a football game. LaShawn Merrit, the 400m Olympian from Suffolk, Virginia, was giving away the prize. He posted a trivia question, to which Cherry responded almost immediately. Cherry: "I answered them real fast and he DM'ed me and told me I won. He told me I could bring one of my friends and we ended up going to the game. He told me everything about his life, about how when he was younger he got in trouble but he stuck to (track and field) and it made him better as a person. He told us to 'Stick to it and train hard and you could be in the same position.' That was great. A professional was telling me this. So from that point on, I quite every other sport and focused on track. I knew I could be better at the time -- My PR was a 48. 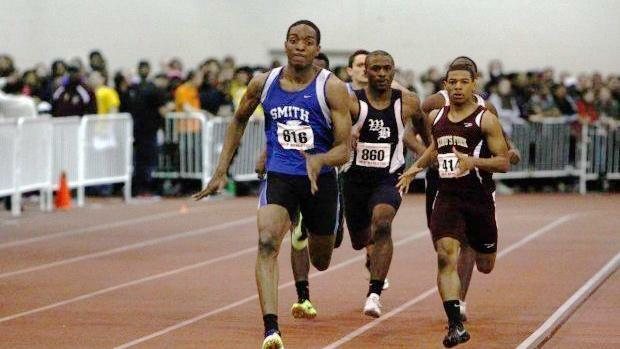 The next year (my junior season), I won the 300m and 500m. I set the junior class record. The rest is history from there." Cherry: "I embraced it because I didn't know the difference. I wasn't used to anything else, so when the 300 was brought to my attention, I thought it was how track was. I thought if I ran anywhere else, it would be the 300 and 500. I thought it would be at nationals. I wasn't used to running, I just wanted to compete. At the end of the day, those first few years the national record wasn't on my mind. I just wanted to be the best in my state and challenge some people around the country when I raced them." Cherry, however, gained motivation by studying other athlete's times across the country. 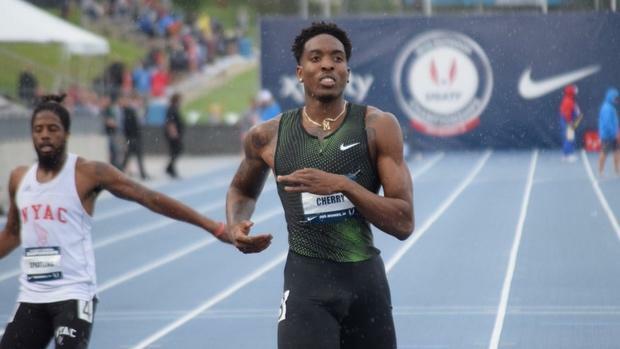 Cherry: "I would go on MileSplit and look at other people's times. I'd look at freshman and sophomore and junior times. I wanted to come up. I think I was top 20 my freshman year, top 10 my sophomore year and then junior year, I was second or third. By the time I was a senior, I wanted to be a national leader. I wanted to be the best in my events. Shoot, I wanted to break the 500m record, too, but I didn't get too many attempts." Cherry ran just one 300m race before his national record. That came on Jan. 19 in Hampton, Virginia at the Boo Williams Sportsplex, but Cherry wasn't necessarily prepared for it. His coach, Justin Byron, the facility's announcer, put him in the race late, and gave him some challenging feats. Cherry: "That race was fun. I wasn't even supposed to run it. I had actually come to the track meet to watch, but my coach (Byron) entered me in the 300m. But he had a stipulation. I had to run in Lane 1 with no blocks. I had to run a three-point stance. My goal was 34.10 and that's what I ran, so we knew we would run crazy fast when it came time for the state meet. That was difficult to run in Lane 1. I was 6-foot-2 at the time and I was always long. So it was hard not being in blocks and running those tight turns. But I was thinking in my head, 'If I had an actual lane and a block, I can run this.' I was thinking I could break the national record. I just ran my PB handicapped. I wanted to see what I could do after. The morning of the state championships, Feb. 23, Cherry was nervous. He awoke at 6 a.m. and felt a little spiteful. He wasn't in the fast lane of the championship, even though he had the fastest seed time. He went to McDonald's that morning and ordered a chicken biscuit and a water, then met his coaches at Oscar Smith and got on the bus. To this day, whenever Cherry is on a bus, he always sits the second seat from the back. He took that seat on this day in 2013. The trip from Chesapeake to Hampton was about an hour, so he tried to find some sleep on the road there. Cherry: "I calmed myself down, listened to a little R & B and a little rap, calm rap. More R & B." When the team arrived at the Boo Williams Sportsplex, Cherry set his things down in the adjacent field house. His first race, the 500m, was about two hours away. As he was working through his shakeout, a hard series of mechanical drills, he was approached by a teammate. Cherry: "One of my teammates said Ricky (Morgan of Forest Park) was talking trash. He said 'Ricky said he's going to win and take care of you.' I don't know if this is true or not, but that got me hype. I'm a trash talker, too. I was ready from that point on." Cherry saw his coaches and talked about game plan. "I don't need one. I know what to do" Cherry said. The gun went off and Cherry was out. Cherry: "I conserved a little bit because I wanted to save energy for the 300, which was a bigger race. I let a guy lead me through the 400m, and then I tried to face him, but I wanted to make it look easy because I wanted to get everyone intimidated for the 300. I wanted everyone to be mentally aware of me, to see they were looking. I wanted to get them off their game. So when I crossed the line, I didn't stop to look at the time. I just ran straight out of the gym. My friends were like, 'Ohhhh, that's crazy, he didn't even look at the time." Cherry jogged over to the adjacent gym to calm down, but he really couldn't. "I knew I had a chance to double," he said. Next up was the 300m. But Cherry was starting to notice how big the moment was. His mother, Tanya Blackwell, was at his race for the first time in his life -- she always had to work during his track meets. He felt it was important to run well for her, to gently show her how talented he was. "Now I'm more anxious." So when I crossed the line, I didn't stop to look at the time. I just ran straight out of the gym. My friends were like, 'Ohhhh, that's crazy, he didn't even look at the time." When the race was finally up, Cherry was a little angry. He didn't have his desired lane. He was on the outside. But his favorite song, 'Love Sosa' by Chief Keef, was blaring on the loudspeakers, so that eased him a little bit. Then he looked up while he was setting his blocks and saw his principal in the stands. "Now I know this is important. I had never seen him at a track meet. That was crazy." Cherry: "I think to myself, 'I have to get out. Everyone behind me is really fast.' I knew I had to get out and put a gap on them early. So by the time they catch up they gas out. I wanted to push for 60 meters, float for 40. I just heard the crowd screaming, 'Woop Woop Woop,' and I knew Mustaqeem (Williams) was closing. I was 150 meters into the race and he was gaining. It was exciting. Cherry: "But I had a finish. When we hit the backstretch with 150 to go, I hit it and felt myself pulling away. Everyone started screaming, I went around the turn and was grimacing with my usual face, but I was trying to stand up. I closed to the line and I didn't even see the time." Cherry: "It was super crazy. Queen Harrison's dad shook my hand. My girlfriend was right there. My mother came up to me. It was great. I was so dead. I eventually fell. They had to take me to the back and give me salt tablets, but my coach is still screaming, NEW NATIONAL RECORD. Cherry: "I was super proud. I remember going to school every day and getting so much love. I felt like my high school never really appreciated track and field before. But I was able to get them to that point. I feel like I paved the way for some kids like Kurt Powdar (a current Oscar Smith senior) to earn respect on a different level. Cherry: "Mostly what I appreciated was the love I got from everyone. It was pretty impressive. They gave me a banner and put my record on a computer screen in school. It was dope." In the years since, Cherry has made sure not to forget about Oscar Smith. During his illustrious collegiate careers at Florida State and LSU, Cherry routinely added to the high school's collection of his trophies, hardware and jerseys. He donates a piece of his success to the school every time it comes. Cherry donated a pair of spikes worn during that 300m race, his Nike Zoom Maxcat's. In the future, he hopes he can give even more back. And maybe even one day run a 300m race again. "I definitely want to run one again," he said. "It would be interesting.